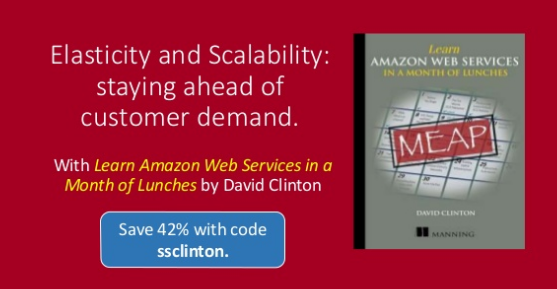 Take 42% off the entire book. Just enter code ssclinton into the discount code box at checkout at manning.com. 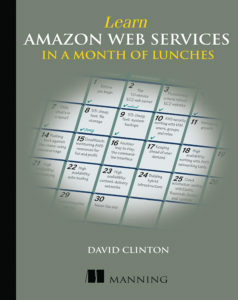 Learn Amazon Web Services in a Month of Lunches gets you started with AWS fast. In just 21 bite-size lessons, you’ll learn the concepts and practical techniques you need to deploy and manage applications. You’ll learn by doing real-world labs that guide you from the core AWS tool set through setting up security and storage and planning for growth. You’ll even deploy a public-facing application that’s highly available, scalable, and load balanced. The slide deck below has more information about the book.